U.S. employers hired more people in December than a year ago, and cities in the Sun Belt are showing solid hiring growth, according to the LinkedIn Workforce Report. Hiring across the U.S. was 24.2 percent higher last month than a year earlier, the data showed. The seasonally adjusted hiring figure was 0.7 percent lower than in November. LinkedIn found hiring growth in Houston, Phoenix and Dallas-Fort Worth was outperforming the rest of the country. Hiring in Houston, which was devastated by Hurricane Harvey in late summer, grew by 14.6 percent from 2016 to 2017 compared with the U.S. average of 10.4 percent. Phoenix’s was 14 percent, while Dallas-Fort Worth gained 11.7 percent. 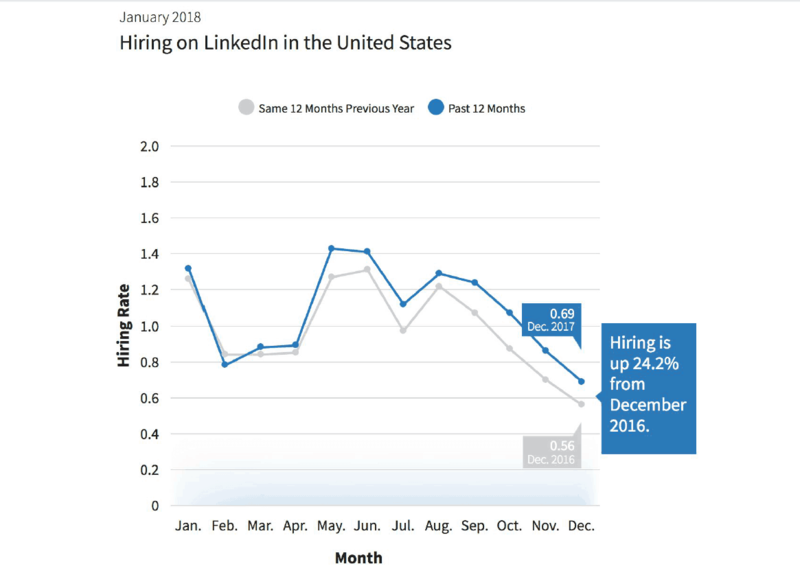 LinkedIn cautioned that hiring growth doesn’t immediately mean people are moving to those cities. The sectors with the biggest year-over-year increases in December were financial services and insurance, up 23.1 percent, aerospace, automotive and transportation, up 22.2 percent, and architecture and engineering, up 21.1 percent. LinkedIn’s report is compiled from its more than 143 million user profiles in the U.S and 20,000 company profiles. LinkedIn has more than 11 million active job listings globally and has more than 3 million new job listings added in the U.S. every month. The Labor Department will release its closely watched monthly employment data later Friday. On Thursday, ADP and Moody’s Analytics said private sector job creation surged in December, the best month for job creation since March.